भारत में प्राचीन हड़प्पा सभ्यता की खुदाई से एक लगभग 4300 ई० पू० वर्ष पुरानी मानव खोपड़ी प्राप्त हुई है जो दुनिया की सबसे पुरानी (ज्ञात) सफल मानव मस्तिष्क सर्जरी को दर्शाती है . Scientists have discovered the world’s oldest known case of a successful human brain surgery after unearthing a 4300 year old skull from the site of the ancient Harappan Civilization site in India. 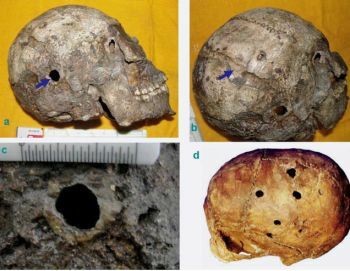 This discovery was done by the scientists from the Archaeological Survey of India (ASI) who found evidence pointing this to be the oldest known case of Trephination in the world meant to treat a skull injury. Trephination is the process of drilling holes in the damaged skull to remove shattered bits of bone from a fractured skull and clean out the blood that often pools under the skull after a blow to the head. A clear rim of 3mm width at the internal border of the hole is the evidence of osteogenesis or healing , indicating that the victim survived for a considerable time after the operation .